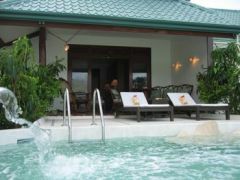 Badian Island Resort and Spa Cebu, is continually striving to improve and upgrade their services and facilities to meet the expectations of their quality conscious clients. The resort’s latest innovation, the exclusive POOL VILLAS, ever since their completion earlier this year, have turned out to be the centre of attraction and a great favourite among their guests. Aside from the balcony, each Pool Villa has its own private sundeck (14 sqm), and an oval shaped, private Seawater Pool (6 x 4 meters). Plunging into ionised seawater, or relaxing in giant shells, guests enjoy the invigorating massage and soothing effects of seawater. Likewise, it is a highly refreshing experience to inhale the therapeutic evaporation bubbling out of the water jet inside the pool. With the most picturesque views facing Badian Bay and the Badian Mountains in the background, there is a mystic feeling of infinity making you one with the sea. The Badian Natural SPA offers all the serenity of Asian beauty secrets combining the mysteries of old recipes, handed down from generation to generation of ancestors, with a touch of modern trends in health, wellness and beauty – an ultimate refuge for body, mind, and soul. Indulge in a rare kind of pampering in an exquisite natural setting. 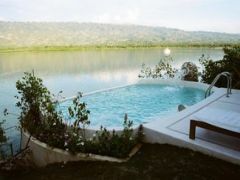 The outdoor SPA and Badehaus Pavilions provide a wonderfully relaxing ambience and offer a breathtaking view of Badian Bay and the silhouette of the mountains. Choose from a variety of Massages, Wellness and Thalasso treatments. Only the best natural ingredients and aromatic essential oils are used. The caring hands of professional SPA therapists will perform delicate pampering guaranteed to soothe your senses and do wonders to your entire being.